Running is one of the most popular and efficient ways to exercise. In fact, nearly 17 million Americans run at least three times per week,1 meeting the minimum exercise levels recommended by the Centers for Disease Control and Prevention. 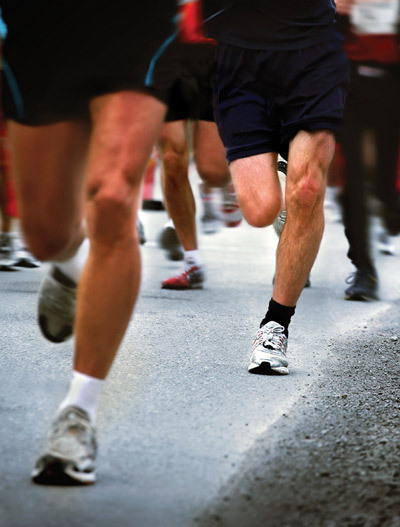 Between 19% and 79% of runners report an injury each year.2 Injuries to the knee and lower leg represent nearly two-thirds of all running-related injuries, with PFP, iliotibial band syndrome, and tibial stress fractures are among the most prevalent.3 In addition to structural and training-related risk factors, abnormal running mechanics are thought to contribute to development of these injuries.4 High recurrence rates for these overuse injuries suggest that traditional treatment regimens are insufficient for long term success. The hip abductors and hip external rotators are the primary stabilizers of the hip and pelvis in the frontal and transverse planes. Consequently, hip abductor and external rotator strengthening is often prescribed as a means to reduce medial collapse mechanics. In the short term, hip strengthening appears to be effective for reducing pain in female athletes with PFP.12,13 However, there is little evidence that hip strengthening actually reduces excessive medial collapse mechanics in runners. Despite large gains in hip abductor and hip external rotator strength, Willy and Davis failed to find changes in proximal running kinematics after a six-week hip strengthening intervention.14 Similar findings were recently reported by Wouters et al in 2012.15 If the mechanics underlying PFP, tibial stress fractures, and iliotibial band syndrome are not corrected, then runners are at risk for recurrence of these injuries. Gait modification and gait retraining have been suggested as interventions to reduce medial collapse running mechanics. Gait retraining is the systematic re-education of faulty gait patterns. Typically, principles of motor learning are employed in gait retraining programs in an attempt to achieve lasting changes in running mechanics. Central to gait retraining is that the faulty mechanics, rather than the resulting injury, is the focus of the treatment. 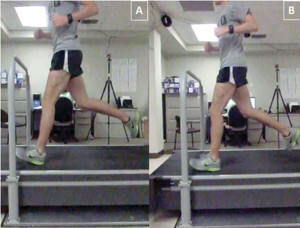 This approach is based on the concept that faulty running mechanics result in excessive loading on the structure in question and that, by directly altering suspect mechanics, the injury stimulus may be reduced.16 Clinically, an effective gait retraining program demands a thorough clinical running gait analysis to identify the suspect mechanics. 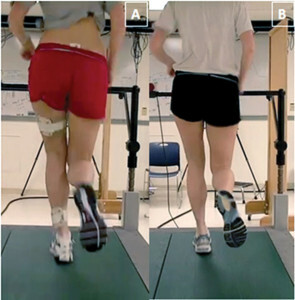 Figure 1: Female runner with patellofemoral pain syndrome demonstrating a large reduction in medial collapse mechanics from pre-mirror gait retraining (left) to post-retraining (right). Note the increase in distance between the knees and reduction in contralateral pelvic drop. Two recent reports found that using either real-time visual feedback or mirror feedback resulted in a reduction of excessive medial collapse in female runners with PFP after eight gait retraining sessions.17,18 Investigators gave runners verbal instructions to “squeeze your buttocks” and “run with your knees apart and your kneecaps pointed straight ahead,” along with visual feedback. Importantly, a faded feedback paradigm was used to encourage runners to shift reliance from visual feedback to their own internal cues. Runners were able to transfer the new movement skill to the untrained tasks of single-leg squat and step descent, which both authors cited as evidence of motor learning.17,18 Improved mechanics and pain relief were maintained up to three months.17 Given that iliotibial band syndrome and tibial stress fractures are also associated with medial collapse mechanics, the potential applications of the mirror gait retraining described by Willy and colleagues could likely extend to the treatment of runners with these conditions. 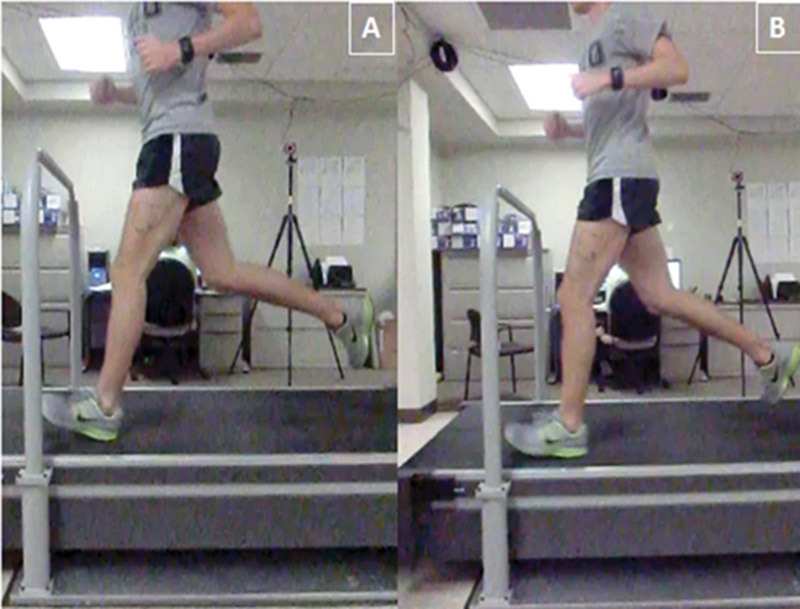 Figure 2: Male runner with history of tibial stress fractures while running at preferred step rate (left) and while running 7.5% above preferred step rate (right). Note increased knee flexion at foot strike. Other types of retraining may also be effective for reducing medial collapse. Heiderscheit and colleagues have reported an immediate reduction in peak hip adduction (approximately 2°) in uninjured runners after receiving a cue to increase step rate by 10%; smaller but significant reductions in hip adduction were also associated with a cue to increase step rate by just 5%.19 A subsequent report by these investigators found that cueing a 10% increase in step rate resulted in greater preparatory gluteal activity just prior to foot strike, which likely improves control of frontal plane hip mechanics.21 Interestingly, these findings were seen in runners who did not necessarily have excessive medial collapse. Theoretically, the reduction in hip adduction could be even greater in runners who do have excessive medial collapse. 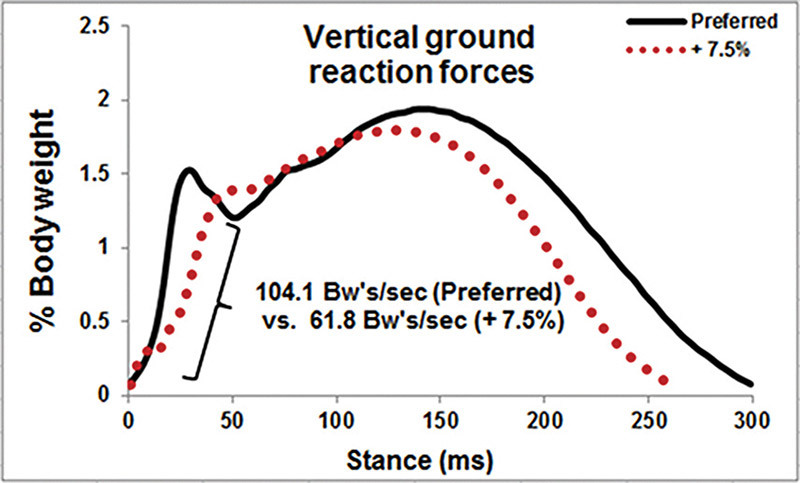 Figure 3: The vertical ground reaction curves for the runner in Figure 2 while running at his preferred step rate and while running 7.5% above preferred step rate. Note the large reduction in average vertical load rate from preferred to 7.5% above preferred. Other researchers have used an accelerometer to cue a decreased tibial shock. In a study by Crowell and Davis, runners were given real-time visual feedback of their tibial shock as they ran on a treadmill.27 The runners significantly reduced vertical loading rates and impact peaks at the end of the eight retraining sessions and maintained these levels at one month post-training. A typical uniaxial accelerometer costs less than $2000, making this type of feedback system feasible for clinics with a high volume of running clientele. Researchers have also explored increasing step rate during running to decrease abnormal impact forces. In a study of 45 healthy participants, increasing step rate 10% from the preferred step rate led to significant reductions in step length, braking impulse, peak vertical ground reaction force, foot inclination angle at initial contact, and energy absorbed at the knee during loading response.19 Interestingly, patellofemoral joint stress has been found to also decrease when step rate is increased.23 Cueing an increase in step rate has significant advantages over several other types of gait retraining: it is inexpensive and portable, requiring only a metronome or some similar method to provide a step rate target. 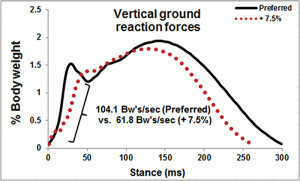 Although the aforementioned studies all demonstrate the potential of various gait retraining techniques, little is known about the most effective way to provide feedback to runners. Runners’ overall motor learning process is greatly influenced by the attention and focus induced by the instructions and feedback provided.28 Frequency of feedback also influences motor learning.29,30 Studies on the effects of instruction and feedback have involved sports such as golf31 and volleyball;32 however, there are no current studies systematically evaluating the effects of different types of instructions and feedback on running mechanics. When practicing a new skill, learners typically receive feedback about a flaw in the movement pattern from coaches, peers, or practitioners. Feedback naturally has an aspect of an internal focus (attention on how the body moves). However, simply changing the wording of the feedback can produce an external focus (the effect on the environment that a body movement produces). Overall, studies have revealed that instructions using an external focus are more effective than instructions with an internal focus.28,31 In a study by Wulf et al, feedback was given to novice and expert volleyball players on the movement quality of volleyball serving.32 Some players were given internally focused feedback, such as “shift your weight from back leg to the front leg;” others were told, “shift your weight toward the target,” which is externally focused. The results showed that external focused feedback produced more accuracy in performance than internal focused feedback for both novice and expert volleyball players. In addition, external focused feedback produced relatively longer or more permanent results during a retention test after one week. In spite of these assertions, it is presently unknown whether internal or external focus yields better results when retraining faulty running mechanics. Regardless of the suggested effectiveness of early gait retraining studies, it is unlikely that the various cues used by the investigators are universally effective for all runners. Clinicians often report frustration while employing many different cues as running clients are attempting to correct their faulty mechanics. For instance, not all runners with medial collapse mechanics respond readily to the cues suggested by Willy et al.17 The development of a simple algorithm to customize feedback for each runner is of interest to researchers and clinicians alike. In such an algorithm, clinicians may provide an internal focus instruction of “squeeze your glutes” and an external focus instruction of “push your knees out towards the walls” during a series of step-down maneuvers while visually assessing changes in mechanics. This quick analysis provides information to the clinician on the type of cueing that is best for the individual during subsequent treadmill retraining sessions. Previous motor learning studies and our clinical experiences highlight the need for more dynamic feedback systems. Clinically, our runners routinely report great difficulty maintaining their retrained gait pattern when running on challenging surfaces, such as when traversing hills and trail running. These subjective reports suggest that an important component in our current gait retraining paradigm is currently missing. For instance, the motor learning literature states that in the early phases of learning, constant practice (one task version practiced) is most effective for motor learning; but variable practice (several task versions practiced) is more effective in the later stages of learning.33 Practicing in a variety of environments and conditions will produce a more generalized motor plan that can be adapted to the different scenarios a runner may encounter.33 Therefore, runners who only do workouts on a treadmill would benefit from gait retraining on a treadmill, but those who run outdoors experience many variations in environment and would benefit from training in a more variable way. A variety of terrains may not be available in a clinical setting, but changing inclines and speeds at random can be easily incorporated into a plan of care for gait retraining in the clinic. However, this feedback system is still reliant on a laboratory or clinical environment. Several investigators are presently testing the effectiveness of mobile feedback devices to employ the concept of variable practice to cue changes in faulty running mechanics during community running. Determining compliance with a prescribed gait modification when the athlete is not in the laboratory or clinic is another major limitation of current gait retraining techniques. Indeed, all of the aforementioned studies rely purely on laboratory assessments to determine compliance with a prescribed running modification. Therefore, new running techniques demonstrated during laboratory assessments may be the result of athletes “performing” for researchers’ benefit, and may not accurately reflect their use of the techniques outside the lab. Evaluation of long-term compliance with new running mechanics through the use of mobile monitoring devices, such as wireless accelerometers, is necessary to truly evaluate the effectiveness of gait retraining to cause lasting changes in mechanics. Overall, moving retraining techniques out of the laboratory and clinic through the use of mobile feedback and monitoring devices may prove crucial to the long-term success of our patients. Despite its promise, the evidence supporting gait retraining as an effective treatment technique is presently low and in its infancy. As the science progresses, more effective techniques to retrain faulty running mechanics will surely emerge. Hopefully, as more effective gait retraining techniques are developed, reinjury rates in runners will decrease. Ashlin Miller, BS, is a physical therapy student and Richard W. Willy, PhD, PT, OCS, is an assistant professor in the School of Rehabilitation and Communication Sciences at Ohio University in Athens. 1. National Sporting Goods Association Web site [internet]. Mount Prospect I. Available from: http://www.nsga.org /files/public/2008RankedByTotal_4Web _080423.pdf. [cited 2009 Nov. 30 11/30/09]. 2. van Gent RN, Siem D, van Middelkoop M, et al. Incidence and determinants of lower extremity running injuries in long distance runners: a systematic review. Br J Sports Med 2007;41(8):469-480. 3. Taunton JE, Ryan MB, Clement DB, et al. A prospective study of running injuries: the Vancouver Sun Run “In Training” clinics. Br J Sports Med 2003;37(3):239-244. 4. Pohl MB, Mullineaux DR, Milner CE, et al. Biomechanical predictors of retrospective tibial stress fractures in runners. J Biomech 2008;41(6):1160-1165. 5. Willson JD, Davis IS. Lower extremity mechanics of females with and without patellofemoral pain across activities with progressively greater task demands. Clin Biomech 2008;23(2):203-211. 6. Noehren B, Davis I, Hamill J. ASB clinical biomechanics award winner 2006 prospective study of the biomechanical factors associated with iliotibial band syndrome. Clin Biomech 2007;22(9):951-956. 7. Milner CE, Ferber R, Pollard CD, et al. Biomechanical factors associated with tibial stress fracture in female runners. Med Sci Sports Exerc 2006;38(2):323-328. 8. Powers CM. The influence of abnormal hip mechanics on knee injury: a biomechanical perspective. J Orthop Sports Phys Ther 2010;40(2):42-51. 9. Souza RB, Powers CM. Differences in hip kinematics, muscle strength, and muscle activation between subjects with and without patellofemoral pain. J Orthop Sports Phys Ther 2009; 9(1):12-19. 10. Hamill J, Miller R, Noehren B, Davis I. A prospective study of iliotibial band strain in runners. Clin Biomech 2008;23(8):1018-1025. 11. Milner CE, Hamill J, Davis IS. Distinct hip and rearfoot kinematics in female runners with a history of tibial stress fracture. J Orthop Sports Phys Ther 2010;40(2):59-66. 12. Nakagawa TH, Muniz TB, Baldon Rde M, et al. The effect of additional strengthening of hip abductor and lateral rotator muscles in patellofemoral pain syndrome: a randomized controlled pilot study. Clin Rehabil 2008;22(12):1051-1060. 13. Earl JE, Hoch AZ. A proximal strengthening program improves pain, function, and biomechanics in women with patellofemoral pain syndrome. Am J Sports Med 2011;39(1):154-163. 14. Willy RW, Davis IS. The effect of a hip-strengthening program on mechanics during running and during a single-leg squat. J Orthop Sports Phys Ther 2011;41(9):625-632. 15. Wouters I, Almonroeder T, Dejarlais B, et al. Effects of a movement training program on hip and knee joint frontal plane running mechanics. Int J Sports Phys Ther 2012;7(6):637-646. 16. Heiderscheit BC. Gait retraining for runners: in search of the ideal. J Orthop Sports Phys Ther 2011;41(12):909-910. 17. Willy RW, Scholz JP, Davis IS. Mirror gait retraining for the treatment of patellofemoral pain in female runners. Clin Biomech 2012;27(10):1045-1051. 18. Noehren BW, Davis I. Does gait retraining hip kinematics alter loading rates in runners with patellofemoral pain syndrome? Presented at the American College of Sports Medicine 57th Annual Meeting, Baltimore, June 2010. 19. Heiderscheit BC, Chumanov ES, Michalski MP, et al. Effects of step rate manipulation on joint mechanics during running. Med Sci Sports Exerc 2011;43(2):296-302. 20. Cheung RT, Davis IS. Landing pattern modification to improve patellofemoral pain in runners: a case series. J Orthop Sports Phys Ther 2011;41(12):914-919. 21. Chumanov ES, Wille CM, Michalski MP, Heiderscheit BC. Changes in muscle activation patterns when running step rate is increased. Gait Posture 2012;36(2):231-235. 22. Davis I, Bowser, B, Mullineau, D. Do impacts cause running injuries?A prospective investigation. Presented at the American Society of Biomechanics Annual Meeting, Providence, RI, August 2010. 23. Lenhart RL, Wille CM, Chumanov ES, et al. Kinematic and kinetic predictors of patellofemoral joint force in healthy runners. Presented at the 60th Annual Meeting of the American College of Sports Medicine, Indianapolis, May 2013. 24. Edwards WB, Taylor D, Rudolphi TJ, et al. Effects of stride length and running mileage on a probabilistic stress fracture model. Med Sci Sports Exerc 2009;41(12):2177-2184. 25. Williams DS, McClay IS, Manal KT. Lower extremity mechanics in runners with a converted forefoot strike pattern. J Appl Biomech 2000;16(2):210-218. 26. Williams DS 3rd, Green DH, Wurzinger B. Changes in lower extremity movement and power absorption during forefoot striking and barefoot running. Int J Sports Phys Ther 2012;7(5):525-532. 27. Crowell HP, Davis IS. Gait retraining to reduce lower extremity loading in runners. Clin Biomech 2011;26(1):78-83. 28. Wulf G, Hoss M, Prinz W. Instructions for motor learning: differential effects of internal versus external focus of attention. J Mot Behav 1998; 30(2):169-179. 29. Winstein CJ. Knowledge of results and motor learning—implications for physical therapy. Phys Ther 1991;71(2):140-149. 30. Winstein CJ, Schmidt RA. Reduced frequency of knowledge of results enhances motor skill learning. J Exp Psychol-Learn Mem Cogn 1990;16(4):677-691. 31. Perkins-Ceccato N, Passmore SR, Lee TD. Effects of focus of attention depend on golfers’ skill. J Sports Sci 2003;21(8):593-600. 32. Wulf G, McConnel N, Gärtner M, Schwarz A. Enhancing the learning of sport skills through external-focus feedback. J Mot Behav 2002;34(2):171-182. 33. Lai Q, Shea CH, Wulf G, Wright DL. Optimizing generalized motor program and parameter learning. Res Q Exerc Sport 2000;71(1):10-24.